Forget the jokes you’ve read about false teeth! The remarkable advances the dental industry has made in material and technology make today’s dentures look and feel more like natural teeth. If you need to replace all of your upper or lower teeth, dentures may provide an effective solution to restore beauty and function to your smile. Your dentist is trained and exceptionally skilled at designing dentures that fit perfectly, allowing you to eat, speak and smile with confidence. Are dentures necessary or purely cosmetic? Having a full set of teeth helps more than your smile, teeth are also a very important component in supporting your lips and cheeks. Dentures can also give you a more youthful appearance by improving a sagging, drooping or even sunken appearance. Plus, the support dentures provide also protects bone and gum tissue, preventing future health and functional concerns. 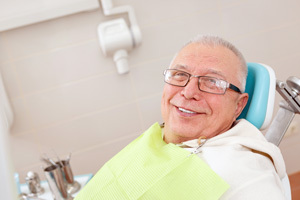 What options do I have when choosing dentures? Full dentures are used to replace all of the upper or lower teeth, while partial dentures are made to fill gaps in the smile. In some cases, Dental Implants are used for permanent support and Dental Bridges may be an alternative to partial bridges for some patients. Your dentist will take the time to discuss all the options with you and help determine the best solution for your needs, your health and your lifestyle.